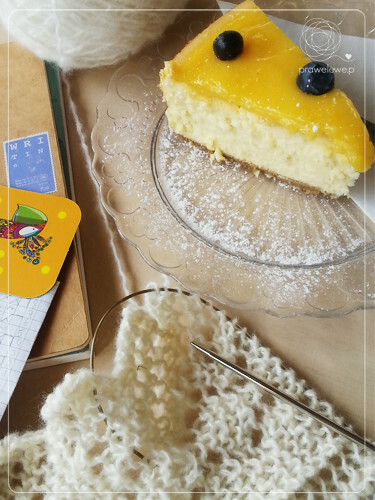 The first time I heard about the celebration of the World Wide Knit In Public Day was in 2011 but it was not until 2013, when I first organised something special for that day. This year was full of records- more countries joined, more events were organised, more people all over the world participated. I hope it will grow and believe that next years will bring new good records. It is such a great way of spreading the news about the craft of stitching in any form. It is also one more reason for going out and spending some quality time with friends, as well as a wonderful opportunity for meeting new people, with whom we all can share common passion for fibre related activities. 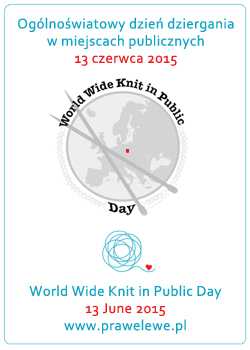 That is why I am happy to notice the growing interest in WWKIP Day event in Poland. We had at least ten event this year organised all over Poland and people were so involved and so joyful. Lovely! I feel that it is not only about the actual event to be held publicly, although naturally it catches people’s attention and gets them involved in the new hobby, but because it is a chance to meet in real life, not via Internet or any other on-line forum. The value of personal contact with people who hand craft things is huge and such meetings are irreplaceable. Of course many people all over the globe get involved with, and thoroughly enjoy, on-line events such as KALs ora CALs, or other -alongs, and it is wonderful that we can do that. Still, personal contact carries advantages not available elsewhere. This year the beautiful weather in Wrocław, Poland added to the atmosphere. When you spend time by a half-wild river, sitting on a green grass, listening to birds and happy people chatting around, gazing at the bright-blue sky with white clouds lazily floating by, there is not much more than one would need to relax and gain good energy. Well, except you move to a lovely cafe to spend the evening with delicious cheesecake, drip coffee and hap knitting! I hope you found yourself a good spot to celebrate this time, either in a cozy corner of your near-by park or somewhere in a cafe with friends, or at any huge event with a lot of people around. Till next year everybody. This entry was posted in dziergadanie KIPs. Bookmark the permalink. Ulu spotkania zawsze są ogłaszane tu na stronie jak również na portalach społecznościowych (zobacz proszę ikonki na stronie prawelewe.pl/about- Facebook, Ravelry, Twitter- każda z nich prowadzi do profili prawelewe, gdzie są ogłąszane wydarzenia). Każde dziergadanie prawelewe to okazja do spotkania na gadanie i dzierganie we Wrocławiu. Zapraszam serdecznie. Mieszkam we Wrocławiu, jak mozna do Was dołączyc na spotkania robótkowe?